At the start of the school term, all of Yale-NUS College’s dining halls reopened with a new counter serving only Halal certified food. While many praise the initiative, concerns have been raised by some students regarding the counter’s implementation. The Dean of Students Office announced the introduction of the dedicated counter via email on August 3, 2016. It came as a part of other enhancements made to the dining halls over the summer. The Octant spoke to Zoe Peters, Associate Director, Dean of Students Office, to learn more about the change. Ms. Peters explained that the change was made to provide Halal certified food while continuing to promote communal dining. According to the Administration of Muslim Law Act (AMLA), the word “Halal” can only be used if the whole servery is serving Halal certified food. “This is the reason for displaying “Muslim Friendly” at the counter. The dining hall committee welcomes any other [naming] suggestions,” she said. This change has been met with a mixed reaction from students that The Octant interviewed. Students broadly welcomed the move as part of building an inclusive community. Al Lim ’19 said that he understood that it “is important for Muslims … [to have] access to Halal [certified] food across the three dining halls.” Maleyka Mammadova ’20, a Muslim student, also praised the efforts made to cater to different religious practices. Others also expressed concern over the use of disposables. Adila Sayyed ’19, said that the usage of disposable plates complicates existing sustainability measures when “these plates are being disposed of into the Food Waste Bin [which is meant for composting].” Further, Tan Weiliang ’18, President of the Yale-NUS Sustainability Movement (I’dECO), said that it is disheartening to see the College “utilizing unsustainable practices especially since it is the recipient of the BCA Green Mark Platinum Award.” While he expressed support for the rationale behind the new counter, he hoped that the school would turn to more environmentally friendly measures. Despite all this, students interviewed remain hopeful for future developments. Jeremy Yew ’20, said that “I understand that this is a temporary measure and hope for a more sustainable long-term solution.” Maria Ivanenko ’17, said she hoped that the dining hall could come up with a solution that would be “something similar to RC4.” This referred to using colored plates to prevent cross-contamination, something Daniel Ng ’18 also suggested. 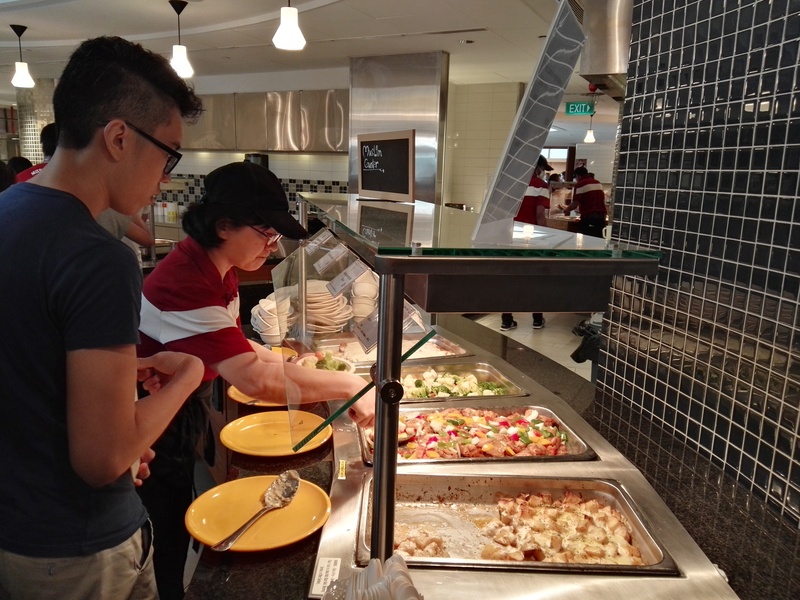 In response to concerns raised by students, Emmanuel Tan, Assistant Vice President of Projects, Singapore Food Industries, said that the dining hall would be introducing new measures at the counter to reduce wastage while continuing to prevent cross-contact. Starting September 5, 2016, all students will have the option to use cornware or communal dishware when they approach the counter. All these are done to ”promote communal dining while catering to the different religious and dietary requirements of the students,” said Mr. Tan. Ms. Peters said that being able to serve both Halal and non Halal certified food together in a buffet setting was “not a common practice” and emphasised the need to comply with official regulations. She encouraged students with feedback or queries to get in touch via email or approach Christopher Stefanik, of the Dining Hall Committee, every Tuesday between 4 to 5 pm at Cafe Agora.